An attractive species from central Mexico (Mexico, Morelos), where it grows at high elevations. 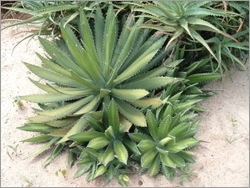 It forms a rosette of quite spiny, gray green leaves that are popularly used to make 'Mexcalli,' a mescal liquor. It tolerates drought and some frost.